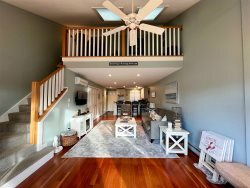 Ogunquit - Walk to Town - 3 Bedrooms! August Vacation Rental Opportunity. In-Town location. *NOTE: The "Total Price" in the Instant Quote box includes your REFUNDABLE security deposit of $400 as well as 9% Maine State Lodging Tax and other applicable fees. Do you crave the white sandy beaches of Ogunquit,Maine? This 3 bedroom, 1 3/4 bathroom vacation rental is ready for your August vacation weeks! Park the car and walk to everything while staying here on vacation. Lobster Pot , crackers, and picks! 6 Beach Chairs available, caddie, beach toys too!